A bit of a cheat this post as I’m simply reproducing one of my static pages I have just updated, but I think this topic actually deserves special attention. 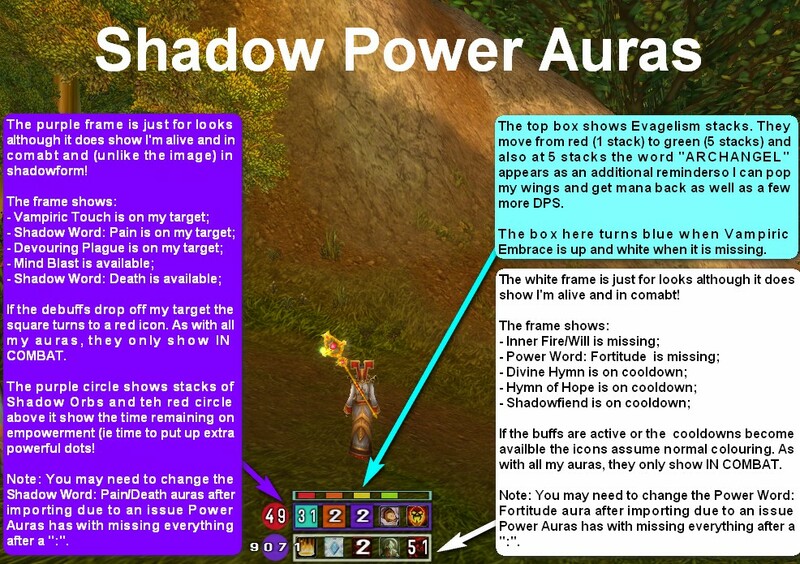 Power Auras Classic is one of my favourite add ons as it replaces many addons that I used in the past as it allows me to create visual and ausio alerts that I design and position for procs like “clear casting”, trinket procs, buffs/debuffs, cooldowns and even equipped items (I have been known to go into battle with my Chef’s Hat equipped! If you dont use it yet I would strongly recommend you try it out. 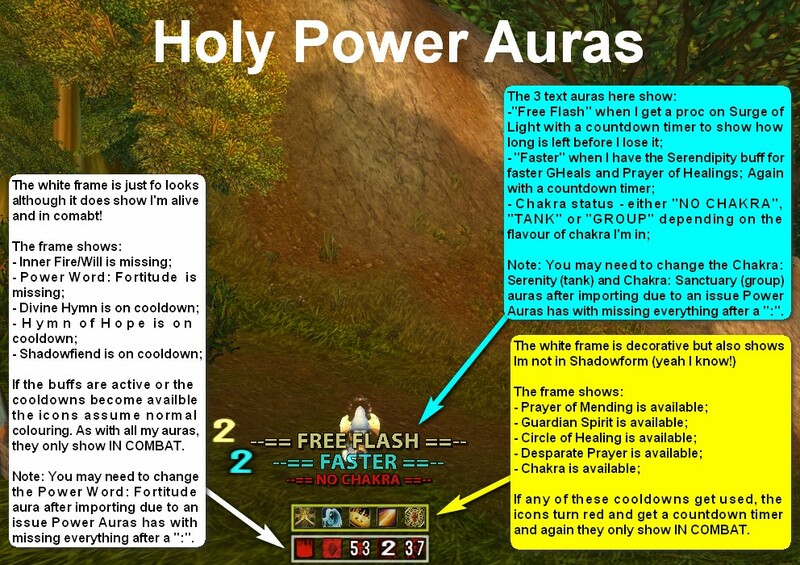 You can download it from Curse or Wow Interface and if you need help there is even YouTube guide and a wiki to help you get started. After a long while of fine tuning the ones that previously adorned these pages, I have recently overhauled them along with my UI so I’m pleased to be able to share them with you, and have them fully documented. 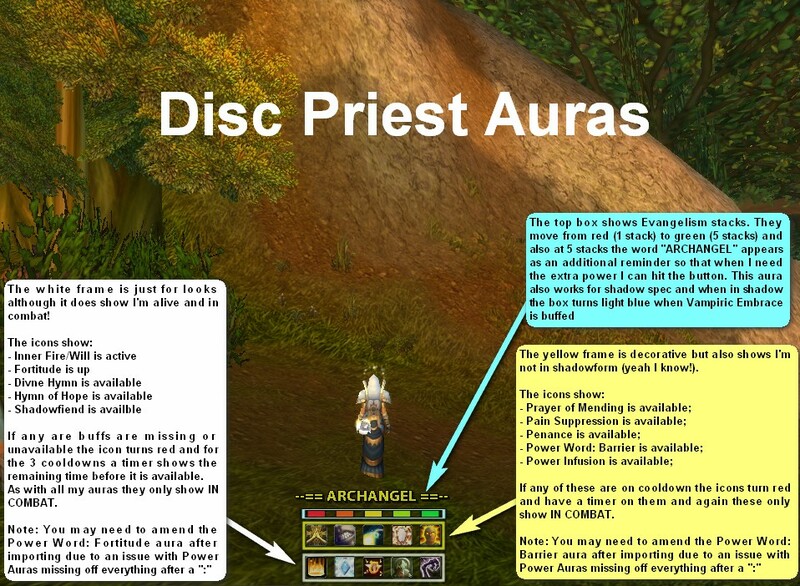 I have my auras split into 4 categories – generic priestly ones and then a set for each spec. The author still hasn’t cured the issue that exists that causes text after the “:” in power word: fortitude, shadow word:death/pain or chakra: serenity/sanctuary to not import so once imported you’ll need to manually update power auras affecting these spells. I really like the Evangelism Aura, it's a very cool way of displaying the information. One problem I've found is that I tend to ignore the auras after a while, so I've started having to use sounds and make them flash to try and grab my attention again. I might borrow some of your auras too, perhaps a change of layout will bump them up and make me notice them again.